Between 9 - 13 September 09 public works will be setting up an ad hoc chair production stall, as part of the Experimenta 09 opening week in Lisbon. The ad hoc production stall will be part of the british contribution to Experimenta, curated by Clare Cumberlidge from General Public Agency, and commissioned by the British Council Arts, London. from locally found and sourced material. cardboard tubes, metal poles, fabric, etc. The stools will be produced on site, using a simple workshop set up. space, using material they bring along. 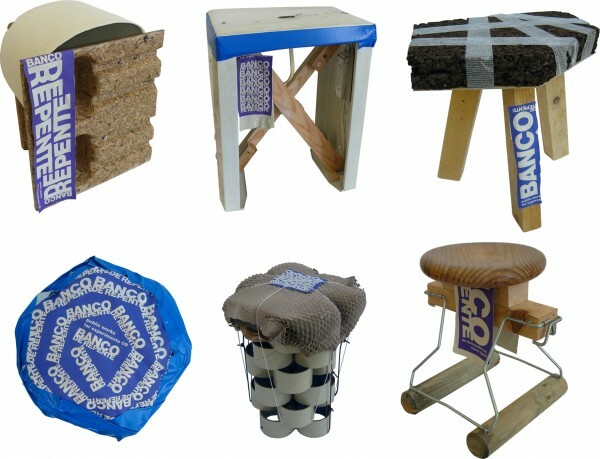 They can also be swopped for new material for other stools. To be used individually, by groups or for random gatherings. The stools can disappear or stay.